ABUJA—Benue State governor, Samuel Ortom, yesterday approved the imposition of a dusk-to-dawn curfew on Gboko town from yesterday, January 31, 2018, until further notice to stop further killings in the area, following the killing of seven persons in the area. According to him, President Muhammadu Buhari has not done enough to stop the killings in the state. A statement signed by the Special Adviser to the governor on Media and ICT, Tahav Agerzua, said the curfew which will last from 6 pm to 6 am every day, was a result of security threats in the area. “Those exempted from the curfew are those on essential services, such as hospital staff and others who show convincing identification. “He has directed security agencies particularly the Police and the Army to provide round-the-clock surveillance in the town so as to forestall a breach of the peace. Reacting swiftly to the President’s letter to the Senate, to the effect that he had taken measures to stop killings in the state, the state government said the President has not done enough to stop the killings. Agerzua said: “You and I know that the killings are still continuing. 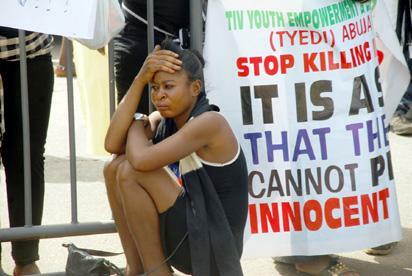 Though the President has drafted the IGP to Benue State to stop the killings, that is certainly not enough. The killings are still going on. “We cannot say he had done enough because he had notice of these killings a long time ago when these people held a press conference and threatened to invade the state; the governor wrote to him severally. “Our tribal leaders also raised alarm and made appeals and also wrote an open letter to the President over the matter before the new year day killings. Reacting in a similar vein, chairman of the joint tribal leaders of Benue State, Chief Edward Ujege, said: “The President has not done enough by all standards because he is saying one thing and his lieutenants in the security council are busy saying another thing. “The Minister of Defence recently attributed the killings to the grazing law. His Minister of Agriculture says the grazing law should not be obeyed because he wants cattle colonies. “The Inspector-General of Police, who though came to Benue to apologize, said it was a communal crisis. “So when your lieutenants are saying one thing and you are saying another and claiming that you are doing enough, what does that mean? It means nothing, so we don’t believe it. “What matters most is what comes from the heart. His aides are saying one thing and he is saying another. We are not confident. It is just like telling you inside a room that it is morning but when you come out you discover that it is evening. “So it is what his people say that is being implemented and worked with because they see him and speak with him and they know what he wants. Meanwhile, President Muhammadu Buhari had yesterday taken a swipe at the Senate over its position that the executive was not putting in its best to address the insecurity situation and killings in the country, especially in Benue State, saying the senators were not correct. Buhari’s letter was read on the floor of the Senate on a day the Upper Chamber vowed to summon the Inspector General of Police, Ibrahim Idris, to explain why he has not been able to arrest and prosecute perpetrators of the killings in Benue, despite the expiration of the two-week ultimatum given him to do so. This came as the senator representing Zamfara Central yesterday raised alarm that indigenes of the state were now acquiring arms to defend themselves against incessant attacks, stressing that Zamfara State had suffered worse than even Benue. President Buhari in a letter to the Senate which was read yesterday by the Senate President, Senator Bukola Saraki, explained the efforts so far made by him and the government to end the killings by suspected herdsmen in Benue State. Buhari’s letter which was dated January 25, 2018, and received by the Senate President January 30, 2018, was in response to the Senate’s resolutions on the state of insecurity in Benue and other parts of the country. In the letter, Buhari recalled that he sent the Minister of Interior, Gen. Abdulrahman Dambazau (retd), and the Deputy Inspector-General of Police (Operations) for an on-the-spot-assessment of the situation, while he was briefed verbally by the Inspector General of Police, Ibrahim Idris. The letter read: “I thank you for your letter referenced NASS/8S/R/01/33 dated 18th January 2018 and I have carefully studied the resolutions and comments therein. As I briefed you and the Rt. Hon Speaker when we met on the 14th January, several courses of action have been taken prior to the senate resolution. “You may recall that I told you of the following steps taken as soon as the information came to me about the Benue killings. “On Thursday 4th January, I sent the Minister of Interior and the Deputy Inspector-General of Police in charge of Operations for an on-the-spot assessment of the situation. “On Friday, 5th January, the Inspector-General of Police briefed me verbally on the latest situation. Calm had then been restored. “On Monday 8th, the Minister of Interior met with the following: Governors of Adamawa, Kaduna, Niger, Benue, Taraba and Nasarawa together with the D-G of the State Security Services, Inspector-General of Police, Commandant-General Civil Defence, Minister of Agriculture and Rural Development, Commissioners of Police from the six aforementioned states and Comptrollers of Civil Defence of the six aforementioned states. “After the meeting, I instructed the Minister of Interior to brief you on the information gathered so far and steps taken. On Tuesday, 9th of January, I had a long session with Governor Samuel Ortom of Benue State during which I informed him of police arrests of some suspects with Kalashnikovs. In addition, I told him that I had instructed the IGP to speed up trial of the suspects and give wide publicity of the Police efforts. “At the instance of the governor, a meeting was held in the Presidential Villa on 15th January, with a wide cross-section of Benue personages where frank and open discussions were held. Everybody appreciated the difficulties of this farmers-herders strife. I assured all of my commitment and assured justice would be done. “Furthermore, I have instructed the IGP to relocate to Benue State and redeploy forces to the most sensitive towns. The Federal Government is initiating measures to address these and other security challenges, alleviate the consequence of these attacks and forestall reoccurrence. The Senate resolution itemised in your letter would be taken into consideration and I am instructing all relevant MDAs to factor them in their work. It will be recalled that senators, on resumption from the 2017 end of year recess on January 16, took time to x-ray the massive killings in Benue State and other parts of the country, giving the Inspector- General of Police, IGP, Ibrahim Idris, an ultimatum of fourteen days to arrest the perpetrators and sponsors of these crimes in Benue State. Meanwhile, the Senate yesterday lambasted the Inspector-General of Police, Ibrahim Idris, over his failure to arrest and prosecute the perpetrators of the killings in Benue. The Senate’s position was sequel to a motion sponsored by Joshua Lidani, the senator representing Gombe South. Moving the motion on the floor of the Senate yesterday, Lidani said the IGP was given a two-week ultimatum to arrest and prosecute those behind the killings but regretted that nothing had been done. “Mr President, you will recall that this Senate passed a resolution when it was considering the report of the ad-hoc committee on security which among other things, visited Benue State regarding the killings that took place on or about January 1, 2018. “The Senate clearly resolved that the inspector-general of police be given two weeks to which he should identify and arrest all those who perpetrated the killings in Benue. “This resolution was passed and transmitted to the IGP but to the best of my knowledge, no arrest had been made and no information had been brought to the Senate as regards the resolution. On his part, Senate President, Bukola Saraki, said security agencies should take ultimatums given to them seriously. Saraki said the upper legislative chamber would ensure that those behind the killings were made to account for their actions. In a similar development, the senator representing Zamfara Central senatorial district, Kabiru Marafa, said yesterday that Zamfara State has recorded more violence-related deaths than Benue, alleging that the state government was trying to prevent people from talking about it. Marafa, who made the allegation on the floor of the Senate, while drawing attention to the security situation in Zamfara State, said the security situation in the state was “getting worse” as people have resorted to buying arms to protect themselves. The post Killing of 7: Gov Ortom slams curfew on Gboko appeared first on Vanguard News.